We are working on an answer. Collaborating with some important friends on a powerful and meaningful event this January here in L.A.
It’s bigger than sneakers and streetwear, and my hope is that it is not only transformational in your life, but in the world. Even though I stressed that this wasn’t a ComplexCon alternative, people still assumed otherwise. But, as I stated, this went beyond fashion and reselling. This was about helping people, calling out injustice, informing and empowering young people, and changing the future. Year 1 of the Trump presidency has been a harrowing and toxic ride. Even though we have had uplifting moments like the Women’s March, the #MeToo campaign, and Roy Moore’s defeat, we are still faced with aggressive white supremacy, threats of nuclear war, and travel bans. If you were like me, you spent most of the year trying to fight back. You carried out long, uncomfortable conversations with family members. You shouted into the Twittersphere. Maybe you even protested in a rally or donated time and money to a cause. This was about helping people, calling out injustice, informing and empowering young people, and changing the future. I reached a point by late summer where I wanted to do more. I do believe it’s important to gather information, rage out, and make noise. But, I knew I had the platform to create impactful, momentous change in my community through art and culture. Yosi Sergant calls this “Artivism.” A former graffiti writer turned Obama staffer who strung together the Shepard Fairey HOPE campaign, Yosi has been leading the charge for artivists for the last decade. He has been organizing shows, connecting the political and art worlds, and bringing the young voter to the forefront. Yosi and I sat down a few months ago in a coffee shop and he told me about this idea. It was called INTO ACTION, and it was kind of like a group art show, but a festival, but like TED talks with speakers and stuff. Oh, there’d be music also. And a cool gift shop. The entire thing, though, was about using art to effect change in our local and global community. He asked if I was onboard, if The Hundreds could help… and I never looked back. 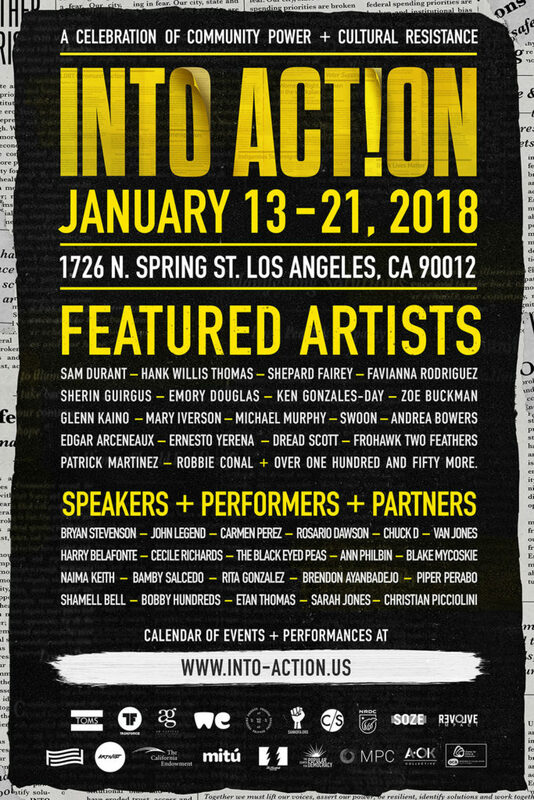 This Saturday, INTO ACTION opens its doors in downtown Los Angeles to tens of thousands of attendees. We have celebrity names like John Legend, Rosario Dawson, Shepard Fairey, and Vic Mensa involved. But, more importantly, we have activists, underground artists, mothers who’ve lost their children to police brutality, and other urgent voices waiting to be heard. DACA. Healthcare. Gender rights. If these things mean anything to you, please come. Diversity. Equality. Social justice. 2018 is a big election year, leading up to an even bigger 2020, so let’s begin here. Tell your friends, bring your children, we made this FREE for you, so you have no excuse! INTO ACTION: A celebration of community power and cultural resistance. Let’s do this together. INTO ACTION combines the work of 175 world-class artists; 80 hours of powerful panels, workshops, and performances; and citizens to shine a light on injustices, galvanize communities, and turn ideas into action. The event is free and open to all ages, so all are welcome, but please RSVP at http://into-action.us. For updates, you can follow INTO ACTION at @intoactionus on Instagram, Twitter, and Facebook. INTO ACTION was created for those of us eager to shape the world in which we want to live. It’s time we illuminate our resilience and take back our hope.